This discursive sqadia.com V-learning medical lecture on Traumatic Heart Disease delivered by Maheen Farooq covers the information regarding features, causes and treatment of traumatic heart disease. Moreover, penetrating cardiac injury and blunt cardiac injury are discussed along with all the relevant information. Miscellaneous cardiac injuries are also considered which includes iatrogenic cardiac injury and intracardiac foreign bodies/missiles. Subsequently, metabolic cardiac injury and pericardial injury is also reported. 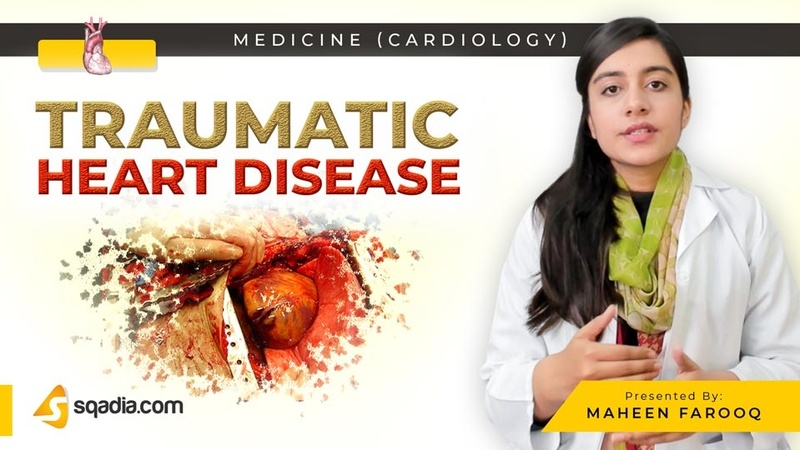 This section is started by the explanation of medical definition of traumatic heart disease. After that features of the disease are presented as twelve lethal injuries results from thoracic trauma. Thoracic trauma causes 10%-70% deaths from blunt cardiac rupture. Causes of traumatic heart disease are penetrating injuries, blunt injuries, and iatrogenic injuries. Penetrating trauma is the most common cause of significant cardiac injury. Maheen Farooq converse about pathophysiology of penetrating cardiac injuries in detail. Clinical Features involve beck triad, paradoxus, kussmaul sign. Definitive treatment is the surgical exposure which involves anterior thoracotomy and median sternotomy. Bypass grafting is also carried out for treatment. Cause of blunt cardiac injury is the direct transfer of energy to heart and compression of heart. Blunt cardiac injuries are manifested as septal and free wall rupture, coronary artery thrombosis. Clinical features and pathophysiology are also highlighted. For evaluation, electrocardiography and sinus tachycardia are conducted. Information about treatment is given at the end of the section. Iatrogenic cardiac injury is caused by various factors such as central venous line insertion, cardiac catheterization procedures. 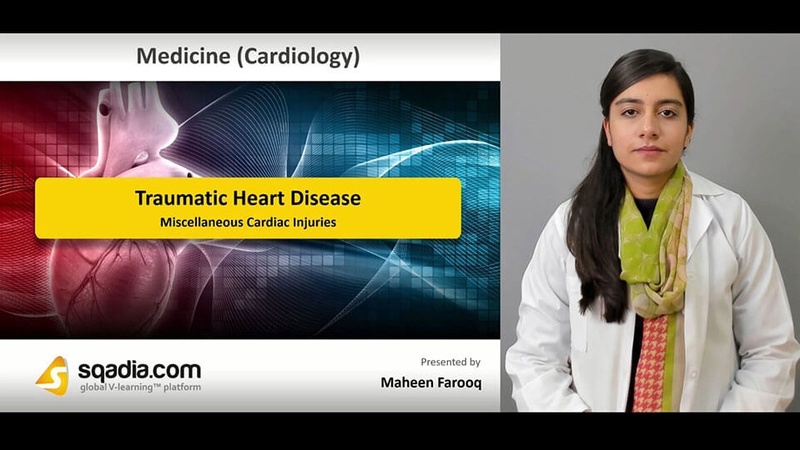 Maheen Farooq also talks about complications from coronary catheterization in this section. Next, intracardiac foreign bodies/missiles comes under consideration. Metabolic cardiac injury/burns refer to cardiac dysfunction in response to injury and may be associated with injuries caused by burns, electrical injury. Balloon pump is used for the treatment of such myocardial depression. Cardiac complications after electrical injury are illuminated along with detailed explanation of pericardial injury.